US Missile Shield in EU Designed to Provoke Russia - Helen Caldicott, M.D. The activation of US Aegis anti-missile bases in Europe is deliberately meant to outrage Russian leaders and is intensifying tensions and security threats in Europe, Nobel Peace Prize-winner Helen Caldicott told Sputnik. 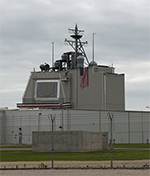 WASHINGTON (Sputnik) – Earlier on Thursday, the US Aegis Ashore missile defense system was officially inaugurated at a military base in Romania, and the construction of a similar complex will begin in Poland on Friday — due to be completed by 2018. “The US so-called missile defense shield to be deployed shortly in Europe is an extremely provocative move focused of course on Russia,” Caldicott, founding president of Physicians for Social Responsibility and co-winner of the 1985 Nobel Peace Prize, told Sputnik on Thursday. She charged that US and NATO defense planners had to have expected the inevitable responses from Moscow in advance because of all the warnings they had received from the Russian government and from Western analysts opposed to the plan. Caldicott also warned that that the reckless decisions by Washington and NATO leaders were sending the world perilously down the path of risking a World War III. Russia has repeatedly warned that the NATO alliance’s military build-up in Europe is provocative and can result in regional and global destabilization.